Open up the front door of most homes and you'll be greeted with a view of the dining area. Whether your dining room serves as an everyday eating area for your family or is reserved for occasional formal entertaining, excellent dining room lighting adds depth and character, enhances the overall mood and brings out the dramatic colors and textures of the space. Consider using two small recessed downlights in combination with a chandelier glowing in a dimmed mode. The downlights should be placed on each side of the chandelier, at a distance of about 18 from the fixture. Circuit the downlights and chandelier separately to maximize lighting flexibility. Elegant or informal, you can illuminate your dining room to create a more gracious atmosphere or a more relaxed mood. You can select the lighting style that accents the unique personality and door of your Dining Room. 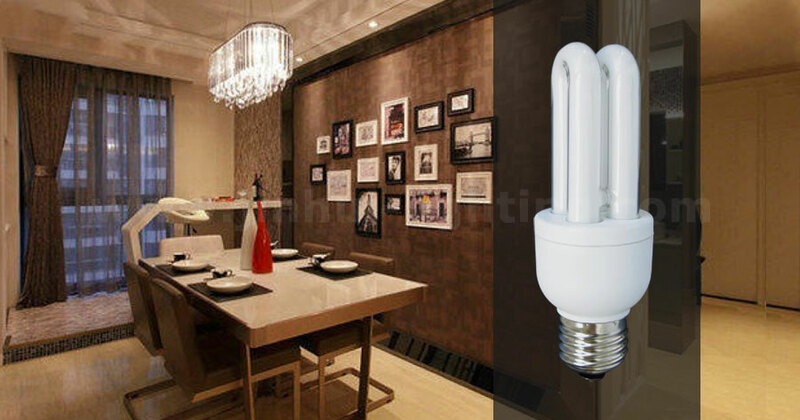 How many energy saving bulbs do you need for your dining room? Accent lighting adds drama to your dining room by adding visual interest. Whether spotlighting sculpture, houseplants, or other decorative items with recessed downlights or highlighting a painting or photograph with a picture light, well-placed accent lighting will further enhance an attractive dining room. Indirect lighting provides soft, appealing, glare-free illumination that improves the mood in a space. Provide pleasant and effective indirect lighting in coves, soffits and other concealed locations.